The First Bed to gain FDA Cleared for the temporary relief of minor muscle and joint pain and stiffness, minor arthritic pain or muscle spasms, the temporary increase in local blood circulation, and the temporary relaxation of muscles. Lightwave uses Multiwave Patented Technology on the 30 individual modules on the surface of the bed. The modules have temperature sensors that check the temperature of the surface to ensure that the bed can raise the tissue temperature at the same time on all parts of the body including the arms and legs. The Lightstim Bed is designed with a head rest for comfort and when using the bed face down. Designed to help rejuvention repair and energize every cell in the body. Composed of 18,240 LED'S and 4 different wavelengths. Studies show that LED Light Therapy can help increase the ATP (Adenosine Triphosphate) and increase the products of NO (Nitric Oxide) helping to protect against cardiovascular disease, heart attacks and strokes and can reduce high blood pressure. Nitric Oxide can help to fight infection and reduce lactic acid build up and prevent damage to cells caused by free radicals and help to improve post-exercise recovery and promote muscle regeneration while increasing whole body blood circulation. NO production can release endorphins to inhibit pain and can protect skin from UV damage. The Lightstim LED BEd delivers light energy in a similar way plats absorb light energy from the sun. Lightstim emits UV-Free beneficial light rays that energize cells and stimulate the body's natural process to build new proteins and regenerate cells. 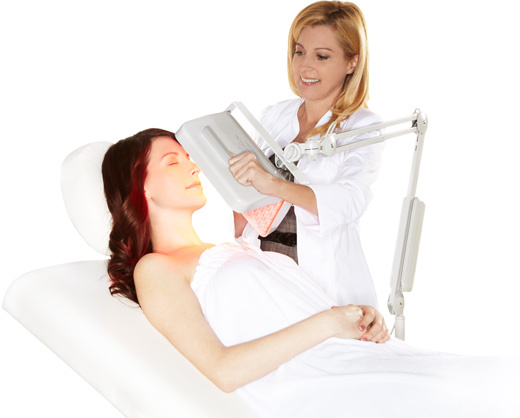 Lightstim is the Largest Manufacture of LED Light Therapy Devices and have been used by practioners for over 15 years. Click the button below to add the Light Stim Red Light Bed with Facial Add On to your wish list.